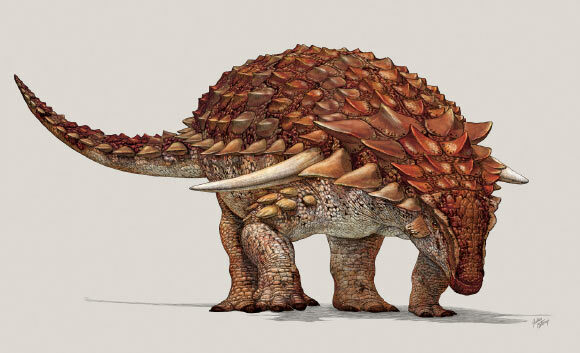 Back in May, I told you about an [ankylosaur] that was found by an oil company in 2011. It took 6 years of careful preparation to remove the hard rock around the fossil, but it is finally complete. This week, its [official announcement] was published in the form of a scientific paper. 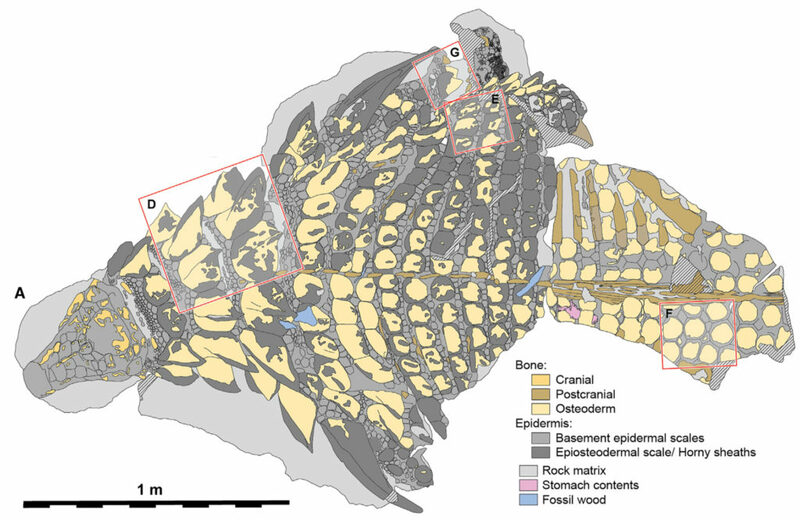 Figure 1 from the paper showing the amazing fossil. This ankylosaur is a nodosaur, an armored dinosaur without a club tail. It is from Alberta, Canada, from 110 million years ago. 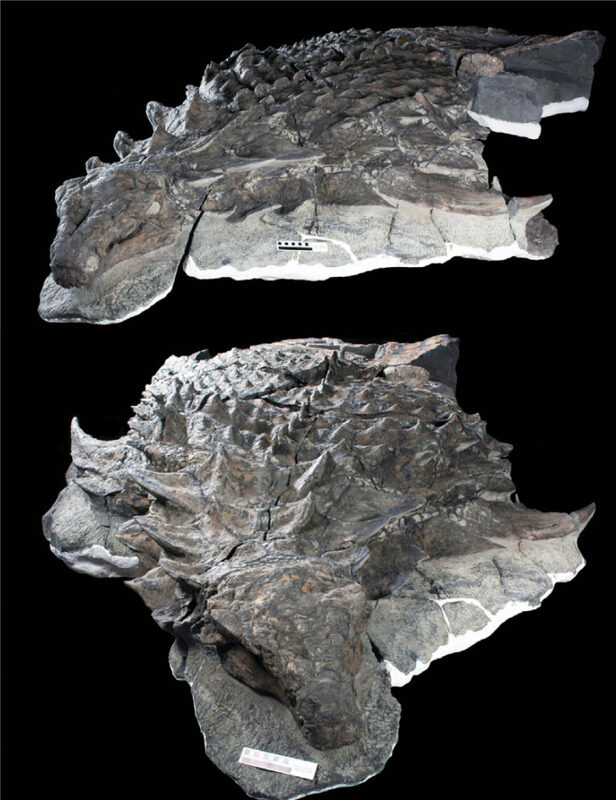 The authors named it Borealopelta markmitchelli, meaning “Mark Mitchel’s Northern Shield” after the person who spent hours uncovering it from its rock, and after its armor and the location where it was found. It seems that when the animal died, it got washed out to sea, sank, and was quickly buried. It’s preserved in three dimensions, and its armor is beautiful. In life, horns and armor are covered by a keratin sheath. Keratin is a hard substance that makes up our fingernails and hair, but also what gives rhinos their horns, covers the horns of other animals, and makes up the baleen that whales use to filter-feed. A rhino skull without the keratin on the left (from Bone Clones) and a rhino skull with the keratin on the right (from Wikipedia). The keratin makes up most of the horn. Keratin normally breaks down very quickly after the animal dies, so it’s not usually preserved. In the case of this nodosaur, much of the keratin is preserved, giving us a complete view of the armor it had. Figure 2a from the paper showing the fossil in a top view. The dark grey is showing all the keratin, the yellow is showing the bone underneath. Additionally, the authors found a unique chemical signature in the keratin. These chemicals are not melanosomes (the cells that make color), but are the products of the breakdown of melanosomes. By examining these chemicals, the authors were able to figure out what colors were present on different parts of the body. A reconstruction of Borealopelta by the Royal Tyrrell Museum. They found that the back of Borealopelta was a redish-brown color, and that the belly was a lighter color. This combination – a darker back and lighter belly – is called countershading, and it’s used by animals who are trying to hide themselves from predators. Today, you can see a similar color pattern in an antelope. 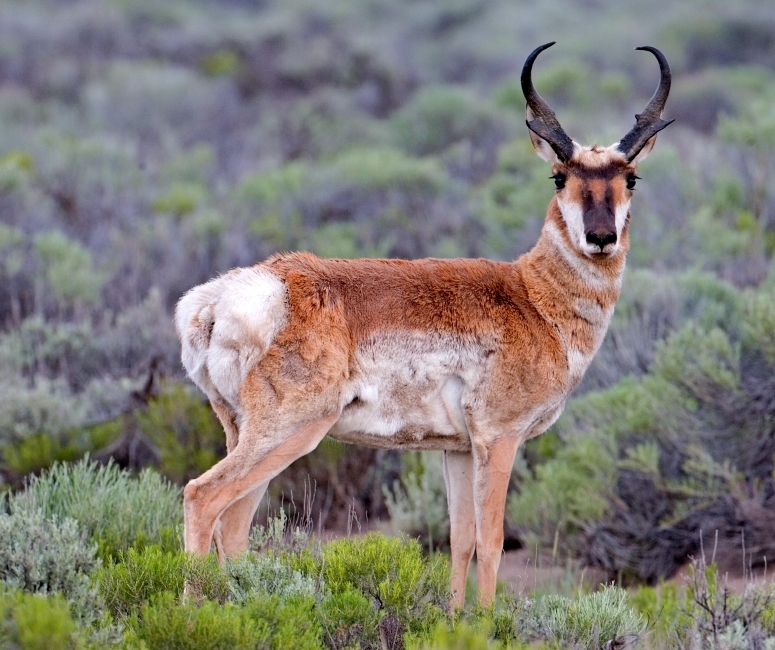 A pronghorn antelope showing counter shading. From Wikipedia. Some mammals, like rhinos and elephants, are so big that they don’t have to hide from predators. Their size keeps them safe. Even though Borealopelta was very large (1300 kg), the fact that it has countershading means that theropod predators were still a threat. There are some who think that the chemicals the authors found may be from the sediment or from bacteria. As always, science continues searching for answers! Even so, Borealopelta makes a welcome addition to the ankylosaur family tree.